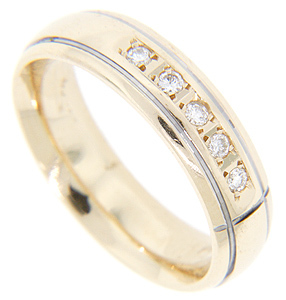 Five sparkling round diamonds are set in this 14K yellow gold men’s retro-modern wedding band. Highlighting engraved lines frame the row of diamonds and span the circumference of the ring. Another engraved line can be found on one end of the row of diamonds. The vintage retro ring measures 6.1mm in width. Circa: 1940. Size: 10. We can possible resize.